You will have the princess flair for your little girl's nursery with the Venetian 4 in 1 Fixed Side Convertible Crib by Storkcraft in an elegant White finish (non-toxic). 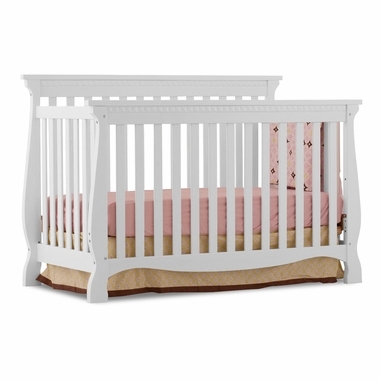 This exquisite sleep time beautiful crib is outfitted with sweeping curves on the posts and bottom rail and is a charming match for any nursery theme and color. Static rails all around and adjustable mattress keep your little one safely in place with no tipping over or pulling out of the crib. Your infant will become a toddler and enjoy the lovely crib turned into a toddler bed with a standard toddler safety rail. When your rough and tumble toddler no longer needs a toddler bed, take away the safety rail and the daybed is all set. Bigger kids reach full size and a bigger bed is needed. These striking side rails are easily fashioned as headboard and footboard for a full-size bed (full-size bed rails not included). This is a solid wood and wood product wonder that you and your child will appreciate throughout the years (JPMA certified).